Central Bankers; Friend or Foe? When Janet Yellen tells us that the future path of interest rates is dependent upon data releases traders are entitled to take that as a policy statement. When subsequent data is below trend or doesn’t comply with expectations for that stage of the economic cycle, monetary policy should reflect that. On June 2nd, the U.S. non-farm payroll figures showed a rise of 138k against an average over the previous six months of 180k. U.S. Q1 GDP was 2.2% and wages growth 2.5%. These are hardly stellar numbers and certainly not the data from an economy that warrants three rate hikes in six months. The reason for the rate hikes is clear but misleading. The stock market is overheating. In 1996, then Fed Chair, Alan Greenspan was accused of “killing” the stock market when he made a speech about the “irrational exuberance” of the ‘90’s dot com bubble. It took another four years for the bubble to burst but that speech, “saying it like it is”, is what we should be able to expect from Central Bankers and Politicians. Of course, Politicians have their own agenda so they can probably be excused. Talking of Greenspan and his successor Ben Bernanke, they commanded the respect of the markets. When they spoke, we listened! Why? Because not only did they have their finger on the pulse, but they only spoke when they had something to say. Bank of England falling foul of conspiracy theorists. The MPC met this week and gave us what we expected; no change to either interest rates or the Asset Purchase Facility. Inflation appears out of control and it is a measure of the respect (that word again) that BoE Governor Mark Carney commands that the market is prepared to take what he says at face value. The recent votes to “stand pat” on interest rates have been 7-1 with only policy hawk Kristen Forbes standing for a change in monetary policy. However, in a major shock (only joking) the vote this week was 5-3. Just enough to tantalize us into thinking that a rate hike is imminent and make us think that the MPC is concerned about rampant inflation but still meaning the status quo remains official policy. Two new converts to the “it’s a clever idea to increase consumers interest burden when they are suffering a fall in real wages” brigade were unveiled. Michael Saunders and Ian McCafferty are respected City economists with long careers in “the real world” behind them. Therefore, their opinion should be respected and accepted. Instead we have conspiracy theorists spouting about how the MPC is nothing more than a cartel where every member does Carney’s bidding and the 5-3 vote was a sop to show that inflation is a concern. Well everyone is, of course, entitled to their opinion but the wider ranging question is credibility. 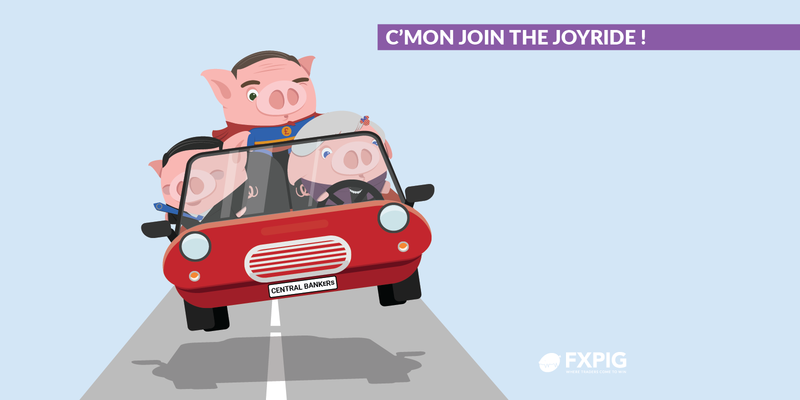 Draghi can put his feet up! Mario Draghi the President of the European Central Bank has had probably the hardest job of all global Central Bankers, certainly in G7. He must juggle the varying demands of nineteen diverse economies each with their own fiscal and spending plans. Add to that the diversity of the recent performance of Northern versus Southern Eurozone members and it is a wonder Sr. Draghi has any hair left at all. Draghi is clearly a considered individual, the late entry of the ECB into the “quantitative easing party” is testimony to that. Anyway, hats off to Sr. Draghi! Even if it is a lot to do with issues he has no control over, the Eurozone seems to be emerging into the “sunlight” of political and economic stability only dreamed about in other countries. Draghi’s predecessors, Wim Duisenberg and Jean-Claude Trichet saw the job handed around like a political hot potato. There has been a clear intention among the members of the European Council to keep the job out of German hands. They have enough influence already and were probably party to an agreement that saw the ECB headquartered in Frankfurt; a symbolic, if not actually meaningful gesture. Duisenberg was clearly a compromise candidate. He managed to “get the ball rolling” economically for the whole Eurozone experiment. The French interpretation of the agreement made with the installation of Wim Duisenberg was that he would resign after four years of his eight-year term, and would be replaced by Trichet. Duisenberg always strongly denied that such an agreement was made. A slightly inauspicious start to an institution that has now become one of, if not the, pre-eminent G7 Central Bank. The role of Central Banks has changed as the world has become smaller. Their interactions in both domestic policy and global intervention was the only thing that saved the entire system from melting down in 2008. As traders, we do not have to agree with their decisions but we should be able to respect them.